Larger watches need a watch winder that holds one watch per turntable (they will often not fit on a turntable that takes two watches, and / or could rub on each other). 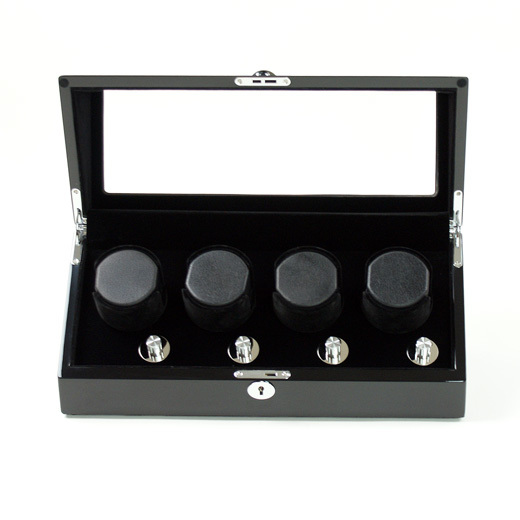 This two-directional four / quad watch winder is ideal for larger automatic watches. It will keep luxury watches fully wound and charged when not in use, also extending the life of the watch. In stock in the UK, ready to ship. For anyone who does not wear their kinetic (movement powered) watch every day, watch winders are perfect for storing a watch. A watch winder will hold one or more watches and move them in circular patterns to mimic the human motion to keep the self-winding mechanism working. The gentle rotation keeps the watch wound and ready to wear. A kinetic watch should be kept wound and running as much as possible to prevent its lubricants from congealing over time, which diminishes their accuracy and damages the watch. This wooden watch winder takes four watches on four separate turntables. There are four switches, one for each turntable, so each can be set to a different program. It has a high gloss piano black finish, a curved viewing window, black velvet interior, big squashable watch pillows and Japanese motors for quiet operation. This winder has a classically elegant appearance and, like all of our products, it is brand new and in its original packaging. d) Clockwise for 5 minutes then turn counter-clockwise for 5 minutes. This cycle will repeat for 3 hour then will rest for 9 hours. 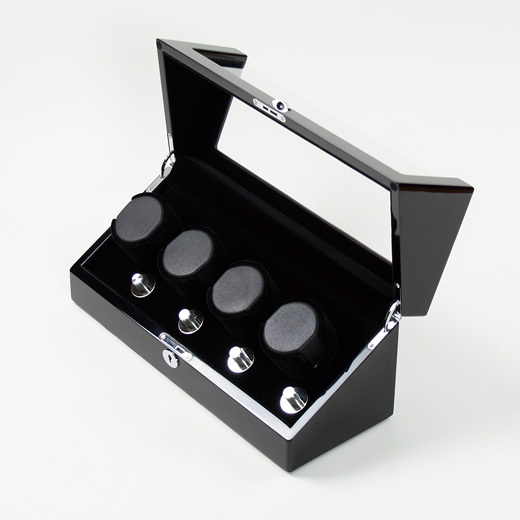 Please note: This watch winder can have the switch set up so that it runs from a - d or from d - a. New / in box with full instructions, making it an ideal gift. Mains operation, supplied with UK plug. The display measures: 420 x 165 x 185 mm (L x W x H). The removable, squashable watch holder will to take a maximum watch strap width of 30mm and circumference of 210mm. It can be compressed to hold a strap circumference as small as 120mm. There is lots of space inside for a good sized chunky watch with plenty of clearance between the turntable and cover. Not exactly what you are looking for? 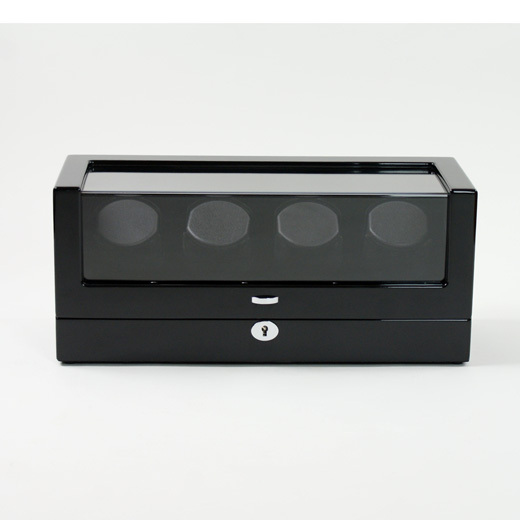 We have a wide range, see ou rwatch winder gallery. Please check that the programs are suitable for your watch. Also note that no watch winder (even the most expensive brands) is completely silent, as they have a turntable and motor. They will often start of silent and get slightly noisier. Our winders are actually quieter than some of the top / more expensive brands. Any watches in the pictures are not included. How will the item be delivered? The delivery method for this item is address / postcode dependent. For the majority of UK mainland addresses the standard delivery method is via Interlink Express. This is a next working day, trackable, courier delivery with 1 hour delivery slot. Northern Ireland, Isle of Man, Isle of Wight, Scilly Isles. We do not deliver to the Channel Islands as they are outside of the EU and express delivery costs are much higher. When will the item be delivered? All orders received before 12 noon Monday to Friday are despatched the same day. Working days are Monday to Friday, excluding bank holidays. Saturday and Sunday are not classed as working days. Orders received after 12 noon are dispatched the next day and orders placed after 12 noon Friday or over the weekend will be despatched the following Monday (unless it is a bank holiday) and should arrive on the Tuesday. Interlink: items typically arrive the next working day. Interlink deliver Monday to Friday (excluding bank holidays) and all orders are trackable. You will receive an email informing you when your order has been despatched. The email will contain a clickable link to track your item on the Interlink website. The day your item will be delivered you will receive another email informing you of your 1 hour delivery slot. The email will provide instructions on how to re-arrange delivery to a more convenient date / time if this delivery slot is not suitable. For orders to Northern Ireland, Highlands and UK / Scottish Islands destinations: Delivery will usually be 1 - 3 working days after dispatch when we use Parcelforce. They deliver Monday to Friday only (excluding bank holidays) and all orders are trackable. Please note all deliveries require a signature. If you are not in, the delivery company will leave a card. Please follow the instructions on the card to arrange a redelivery of your item. We offer a limited return to base warranty. All items can be replaced at any time within 30 days of purchase should a fault develop. We will refund your postage cost once we have received it back. We will then return the item to you at our cost. Outside of this period, should a fault occur, we will help you resolve it. If repairs are necessary, we ask customers to pay for postage and for spare parts. We do not charge for labour.